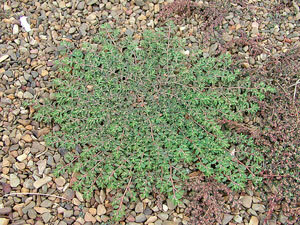 Spurge is a low-lying “creepy crawly” weed that is common in the summer and early fall and is a real nuisance. It thrives in areas where there is excess water draining from plants or tree wells or in areas of a yard where water does not drain or run off. If left untreated it spreads and the sticky leaves make it difficult to pull. Our pre-emergent (weed prevention chemical) applied to infected areas annually work well to stop the growth and spread of this weed. Once watered in our chemical prevents this from returning. It is also advisable to keep water contained to plant and tree wells. Existing spurge is also easily killed with a strong post-emergent (weed kill) herbicide. Once it is brown and dry removal is easy.